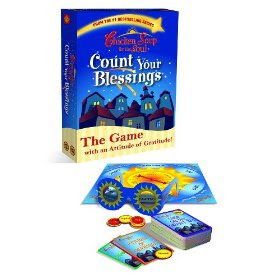 Summary: FROM THE CO-INVENTOR OF “BALDERDASH", ”The Chicken Soup for the Soul: Count Your Blessings” Family Game can help your family and friends connect and “play their way to gratitude” for years to come. You see, the trick is, in order to count the blessings in your life, you have to find them first. That’s why they’re called blessings-in-disguise. The good news is that every cloud really does have a silver lining. And, once you start to play this insightful and often hilarious new game of “seek and find”, you’ll become an expert too! Then, if you misplace your IPod, there’s sure to be other “music to your ears,” and if the computer crashes, you can be grateful it wasn’t the car! Do some time in the Thank Tank, and watch everyone’s glass go from half-empty to half-full. Give the “Look on the Bright Side” glasses a try, and see how clearly you can change your life by changing your outlook. If it sounds easy, that’s because it is – and, more fun than you can imagine. Since it's the start of a new year and a time when I have certainly been counting my blessings, I thought it was appropriate to giveaway a Chicken Soup for the Soul Count Your Blessings Game. To enter, all you have to do is leave a comment telling me about one blessing in your life. Please leave a way for me to reach you. I will randomly select the winner from all of the comments. This giveaway will be open until Friday, January 22, 2010 at 11:59 p.m. ET. I will notify the winner the following day. This contest is open to those of you with U.S. addresses only. Good luck! Thanks to Phenix & Phenix for providing this game for giveaway! One blessing? My family! They are the biggest blessing! My family. They've supported me, let me rant and rave, and cry when I needed to through 3 very long years of law school. I wouldn't be graduating in May without them. My blessings are my friends and family. They do support me emotionally. Oh there are so many blessings, but if I have to pick one (I still have to cheat a little), I would say my niece and nephew! I adore them and being an aunt to them is my greatest blessing/joy! In 2009 I was blessed with a new granddaughter. She was born at 23 weeks weighing 1 pound 2.7 ounces and was 11 1/2 inches long. They didn't give us any hope before she was born, but our little miracle girl came home to us in July after 4 months in the NICU. She is truly a miracle and a blessing. What a great game!! As my triplets approach their 6th birthday, I am so blessed by their health and strength! Thank you! A blessing in my life..is just having the knowledge that God is leading. all we have to do is follow. Everything is a blessing. Waking up to a new morning, being given another day to work God's Will in your own life, and to touch the lives of others.